People are looking for a sense of purpose at work and ask themselves, “Do I love my job, or do I just like it? Does my employer share my values? There are many factors at play when someone is trying to choose where they want to work. At the same time, the competition for talent has never been more fierce. Traditionally, organizations have thought about their offices as a place to park their people. • 53% of employees say they can’t find the right types of space they need. • 43% are seeking deeper relationships with colleagues and believe informal spaces can help build more trust. This data is telling; people are unsatisfied. Traditional perks like higher salaries aren’t enough to convince people to join a new company or stay with the one they’re already with. For Gen Z (born 1994–2008), salary isn’t even a top-three priority, according to the 2017 Change Generation Report conducted by the Lovell Corporation. For the first time, passion is ranked as one of the top three work values. Employers will be required to keep their spark alive in the workplace—ensuring work speaks to individual interests, provides growth and aligns with employee values. There are three critical factors for companies to invest in creating an optimal employee experience—physical space, culture and technology. Very few organizations think about these three factors holistically. They are usually managed by separate people with separate budgets. Human resources, information technology and facility leaders rarely sit in a room to talk through how their roles intersect to build the places where people want to work. A survey that measures companies on how well they invest in physical space, culture and technology was conducted at over 250 global organizations. Organizations who prioritized integration of technology, space and culture had more than four times the average profit and more than two times the average revenue. Stay tuned for part two in a couple weeks, as we further explore this fundamental relationship. Finally! 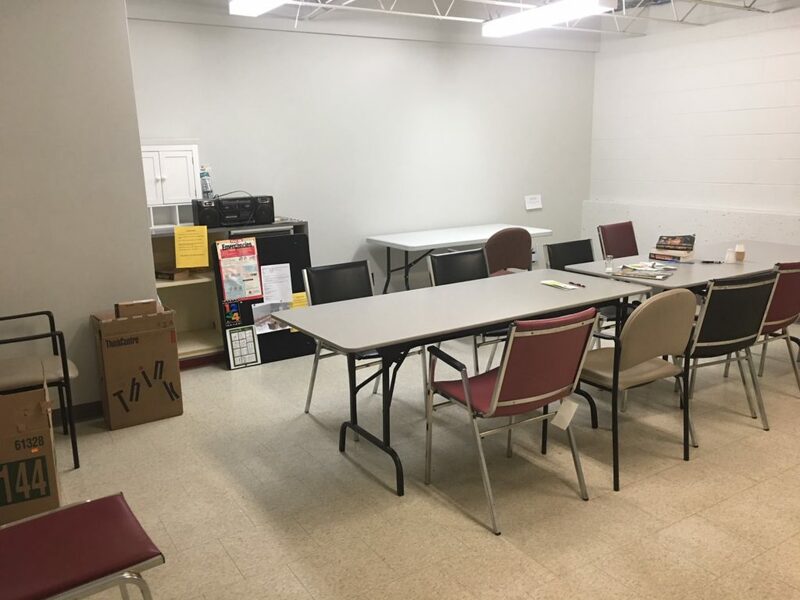 Brant Staff Room Reno!!!! While we’re busy making great, creative spaces for others, our own lunch/break area has suffered. But not any more! We recently updated our team lunchroom. Including a lounge area, upgraded wifi and space heater. We also painted the room and added a touch of art. The comfortable furniture has already got staff’s attention, as we’ve noticed a marked increase in use of the space. Check out the before and after shots. All items sources by our team of professionals. BEFORE – Not very welcoming, is it? we’ve got lots of great ideas to keep your staff productive. There are some things you can do to make it less-so. When employees feel positive about the spaces they work in, productivity improves, collaboration increases and creativity peaks. Who wants to be stuck at one single desk, day after day after day? That gets boring quickly. And, it’s just gotta harm productivity, no? 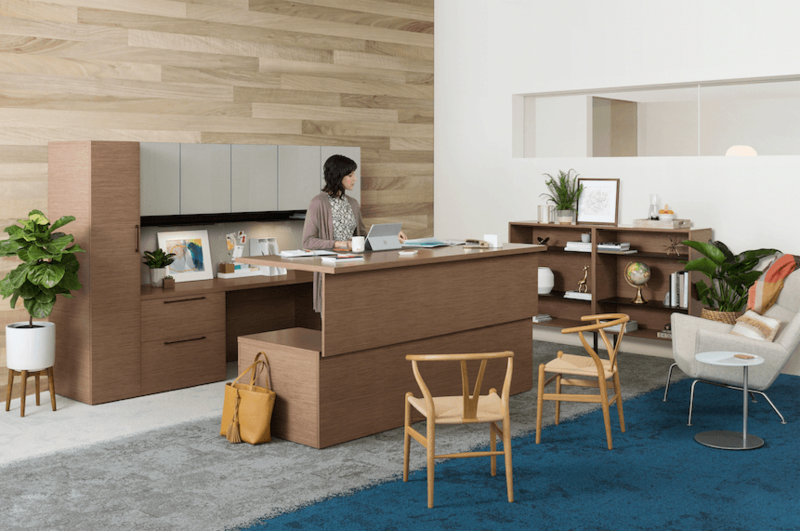 Our staff of designers recommend you provide spaces that give control and choice over where work is completed. Shared spaces, collaborative commons, private nooks…all can give your staff the chance to be their best each day. Through a variety of spaces, we’re sure your staff will improve their focus, and it will show in the work they do. 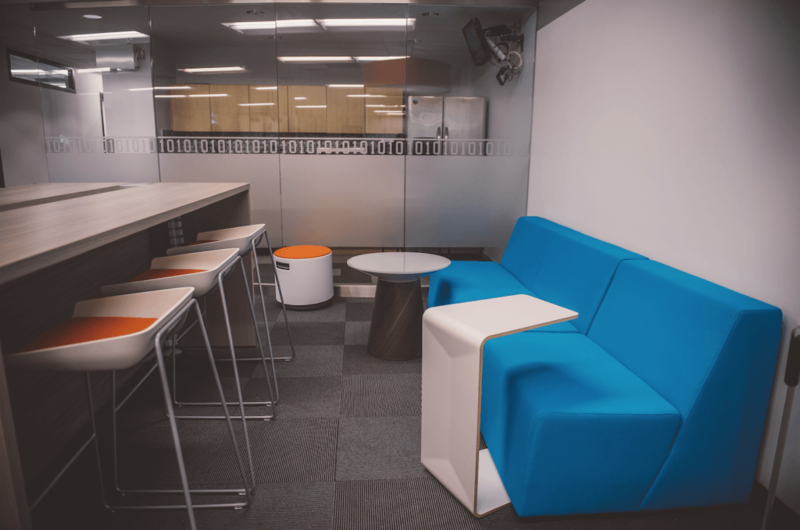 When you have versatile spaces for one-on-one or small group work, and interesting spaces for larger teams, you build, within your staff, personal connections and strong collaboration. Give our skilled design team a chance to talk you through the options available to bring your office into the future…where workspaces are constantly evolving. For insight into a changing workplace, various spaces like we talked about above and the tools used these days to get knowledge based work done, check out this interesting video on knowledge work. The health of any organization is dependent on the wellbeing of its employees. A healthy workplace safeguards the company’s most significant investment – its people – ensuring maximum efficiency and innovation. Height adjustable desks are designed to support the physiology and biology of the workers to make the workplace a more health-conscious environment. Providing employees with environments that support wellbeing is essential to the success of an organization. 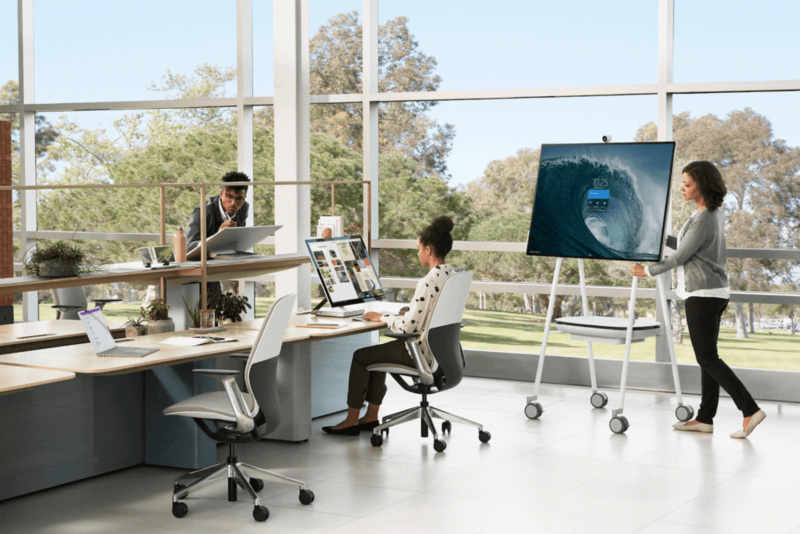 Height adjustable desks allows employees to transition from seated to standing height postures throughout the day, stimulating mental and physical activity and promoting wellbeing in individual and group workspaces. Brant offers solutions that support the wellbeing of leaders and professionals at work as well. These elegant solutions provide the flexibility to shift postures throughout the day while enhancing workspace status and image requirements. Brant offers a combination of electric mechanisms and non-electric options to encourage frequent workstyle transitions. Countless studies show that people are healthier and more and more productive when they can change postures in their workspaces. Want a demo? Contact our professional, knowledgeable design/furniture staff for a tour through our showroom, where we can demonstrate the options available, to make you more comfortable and productive in the workplace. Health & safety + a whole lot more! The team at Brant Basics are always working to bring you the products you need, when you need them. We have years of experience in the field, and our team of helpful staff members are highly qualified to help you find the solutions you need to support your home or business productivity. We are always sourcing and expanding our offering with new, in-demand office supplies and office design ideas. 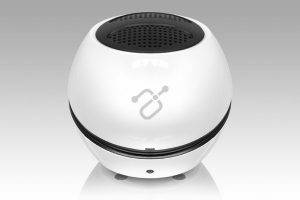 We want to highlight some aspects of our 2017 product offering which you may not be aware of. In the ever important Health & Safety category we offer a broad scope of quality products. Did you know we offer sanitation/maintenance supplies? As well, did you know that ladders and shipping supplies are part of the line-up? As well, we have a full range of fire extinguishers, respirators, paramedic blankets, bandages, safety gloves, crutches and even wheelchairs. The needs of an office are always changing and highly diverse, and we work to meet the needs of a very wide range of clients, from one and two person home offices, to major employers with more than 500 on staff. So, give us a call or drop by the store and showroom on George Street in Downtown Peterborough. Our friendly, knowledgeable staff are here to help. 5 reasons to choose Brant Basics? Following are some recent installations by our furniture and design team. We’re a collaborative and problem solving bunch – who enjoy a challenge. 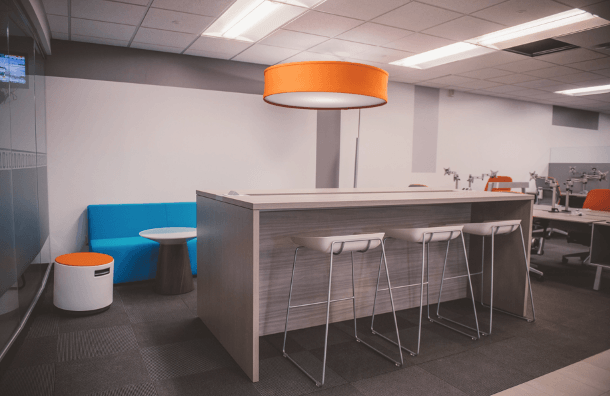 We love to create spaces where people feel able to work, socialize and be productive. See below, and give us a call next time you’re got a project which needs some thoughtful eyes. 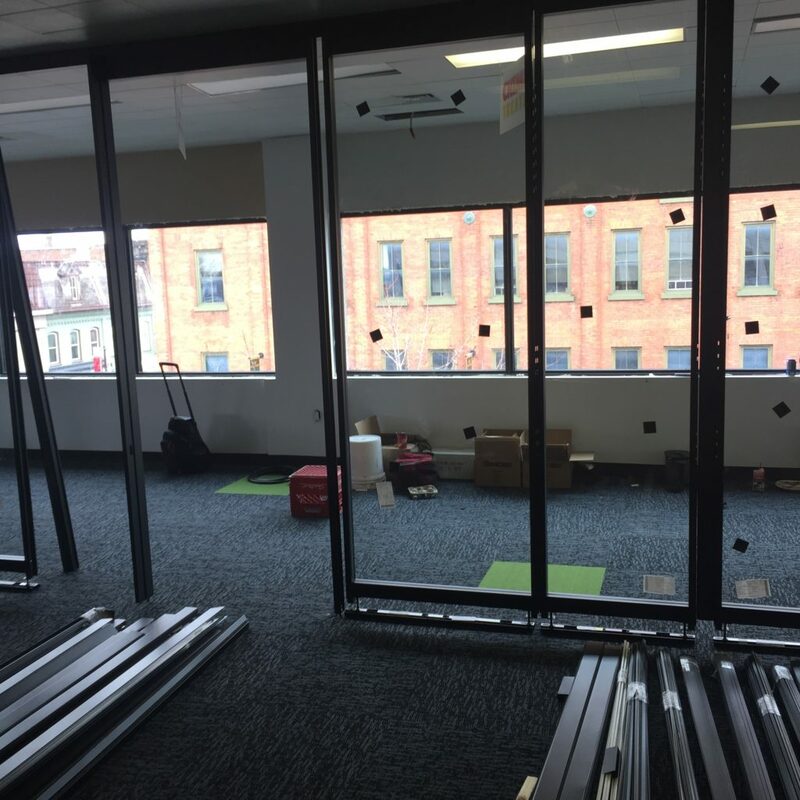 We are proud of the work we do, and our customers are equally excited at their new spaces. All Saints Catholic Secondary School – Working with a really large space, the mandate demanded we create different environments within. With a learning commons, it’s important to cater to all types of people and work – introverts and extroverts, private and group study. Person A might like studying in private (enter the Steelcase Brody) and person B might learn best by working with their classmates (enter Steelcase Verb tables). 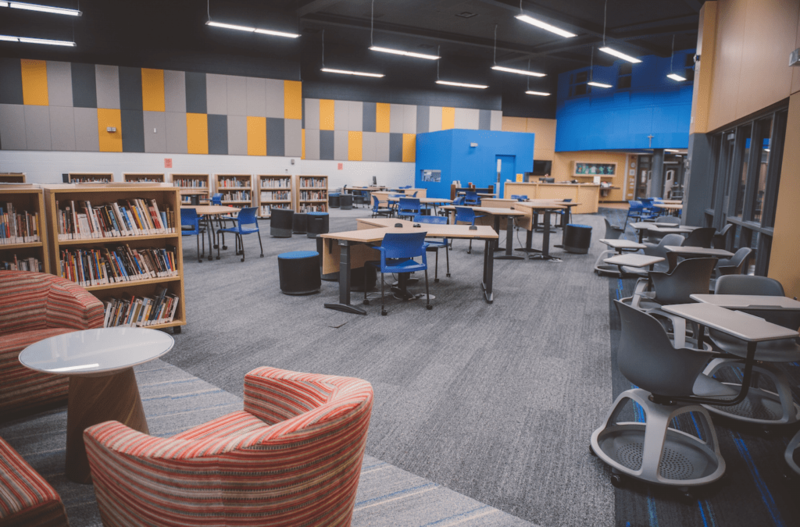 Another important factor for the librarians at All Saints was mobility – the ability to quickly transform the space from one setting to another, affording a wide range of uses – teaching classes, larger presentations, small group work and individual study. Everything from the chairs, to the tables and even the library stacks are on casters. The arrangements are endless! It’s awesome to see the space being used to its full potential. We offered products that support group, individual, social and teaching scenarios. Durham Catholic School Board IT Department – The challenge was to integrate a traditional office with more practical spaces for the specific work being performed, including a social space, which was lacking. The department often had visitors – people who would drop in, but had nowhere to work – rather like a co-work space, therefore this space would not only act as a touchdown area for those workers, but as a casual meeting space. The table pictured is called the Campfire Big Table – the design was inspired by residential tables that draw people together. It is 40”H meaning people can both sit and stand at the table, making it a great area to collaborate. 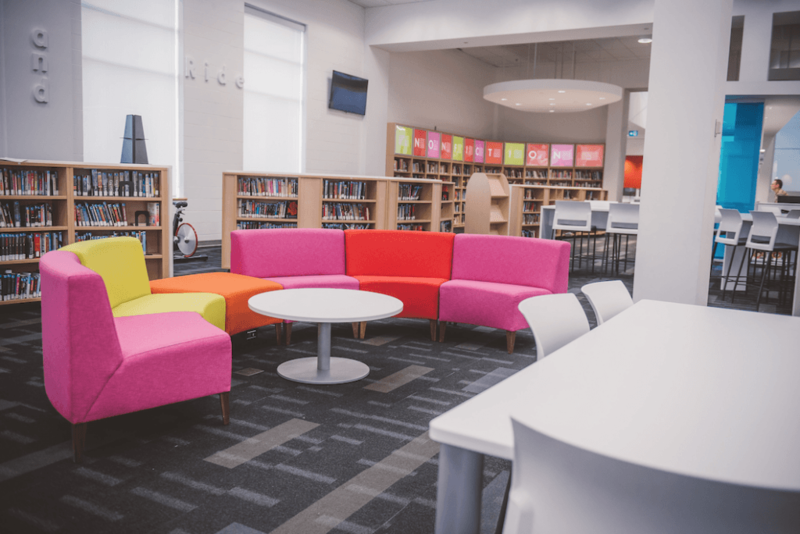 Notre Dame Catholic Secondary School – This project shared some similar traits to the All Saints learning commons (see above) which was to create different learning environments within one large space – collaboration, teaching areas, private study space. The Brant design team, working with the architect, had a vision with this project and played a large role in choosing the product and colours. Mobility of the furniture was not as important in this case, but some of the tables and chairs are equipped with casters for easy reconfigurations. 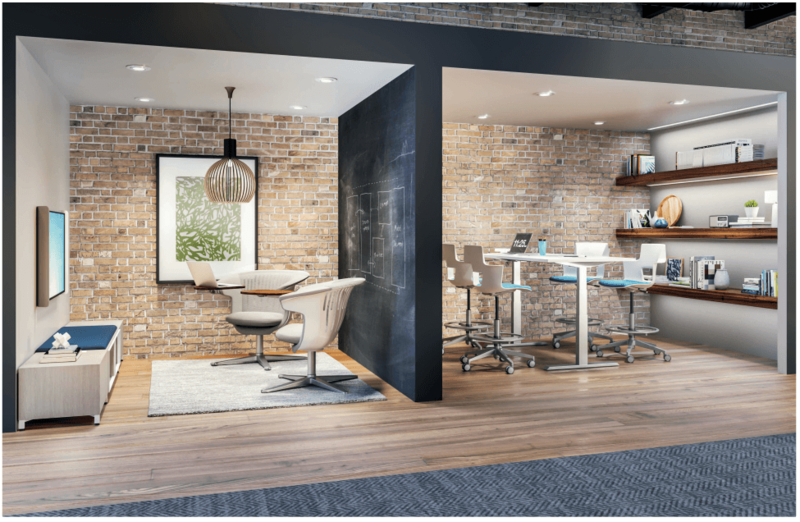 The soft seating you see is Coalesse Circa – it is available in many configurations and is great for both individual work and casual collaboration. 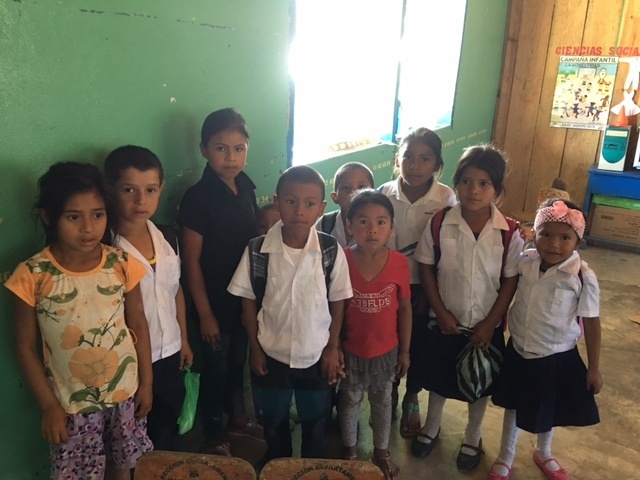 Our own Sue, along with other local and district Rotary Club members travelled to Honduras to implement the first of many literacy and education projects in remote Honduran villages. The first initiative was to distribute water filters. By improving the quality of water, the health and attendance in schools will improve for the young children who attend up to grade 6. 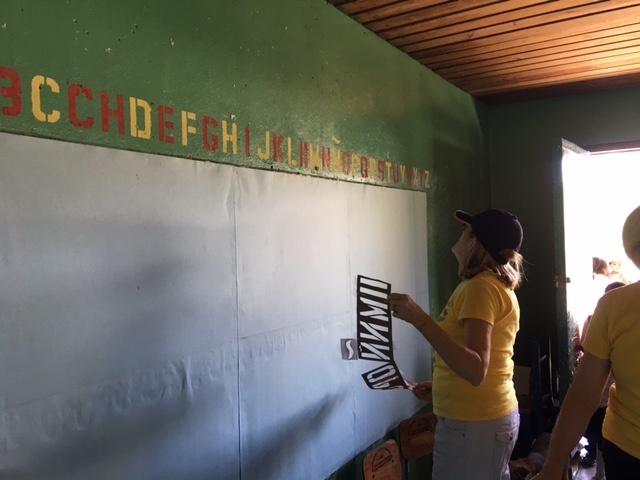 Team members also painted the Spanish alphabet (previously absent in all the school rooms) and numerals from 1-100 so children can improve their counting and math skills. 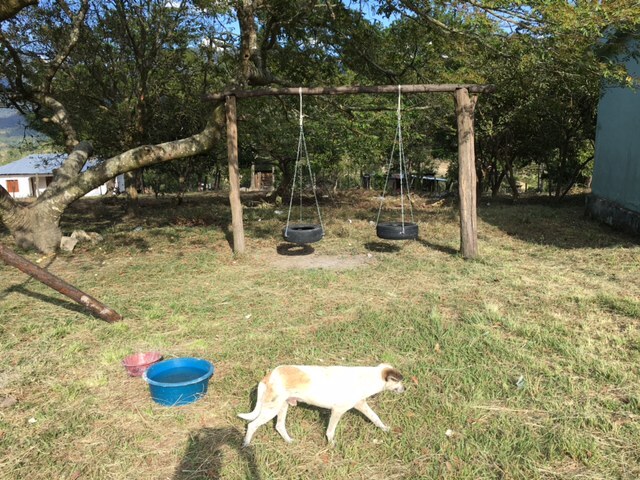 For fun we built tire swings, tether ball games and a climbing ladder at each school which were void of any play equipment. We hope this will entice children to attend school more often as it adds an aspect of fun. On another note, a larger project is in the works for a teacher training centre in a village. The training centre will train teachers and act as a central resource area for educational supplies. 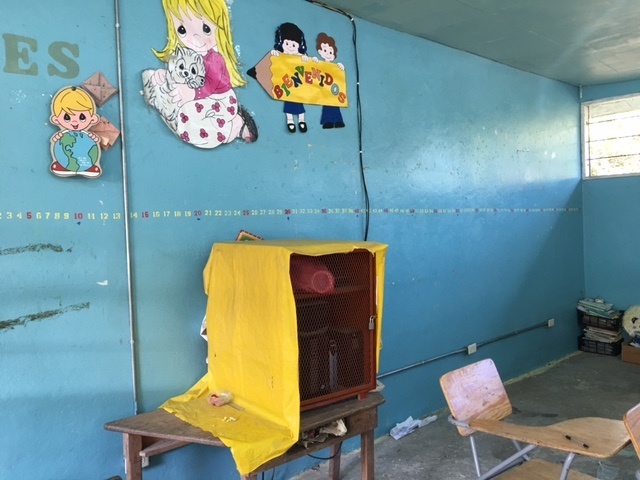 Students and teachers also received lots of office and school supplies to help them with their studies. A second and third trip to Honduras are being seriously considered by the group. As a company, we feel it’s our duty to give back to the community – and working through Rotary is just one way we give back. Follow us on social media for info on our monthly community partner program, or stop by the George Street window and learn about things and organizations worth supporting in our own community. 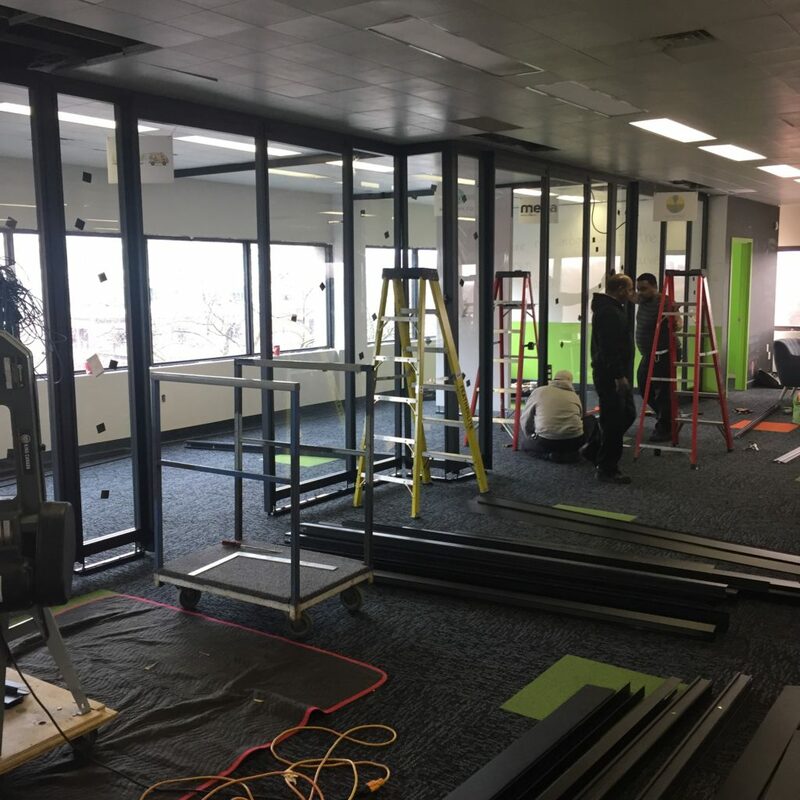 In-progress pictures from the Innovation Cluster here in downtown Peterborough. Featuring a product called Privacy Wall by Steelcase. It’s a modular wall system that uses glass, fabric and whiteboard panels to create space division, much like our office. 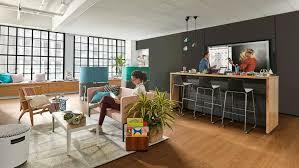 It’s a great alternative to traditional construction because it can be altered and moved in the future (ie, if someone wants a larger office, the walls can be taken down without having to completely disrupt the office). We are so pleased to be working with The Cluster on this amazing project which will work to guide business innovation in the region for years to come. Brant is your local dealer for Steelcase office products. Give us a call – we’d love to work with you. These days, workers (you, me – you know…people) are rejecting the uninspiring sea of sameness that has come to be known as “the office.” Standardized for efficiency, this uniform approach limits potential for inspiration, expression and social connection with others. This office rebellion is causing organizations to rethink their workplaces — from a singular focus on efficiency toward a pluralistic approach that enriches the emotional, cognitive and physical wellbeing of people. Thoughtfully curated destinations blend design, materiality and performance, and give people freedom to choose where and how they work. These destinations deliver a more human experience while still providing the tools and resources people need to actually get work done. 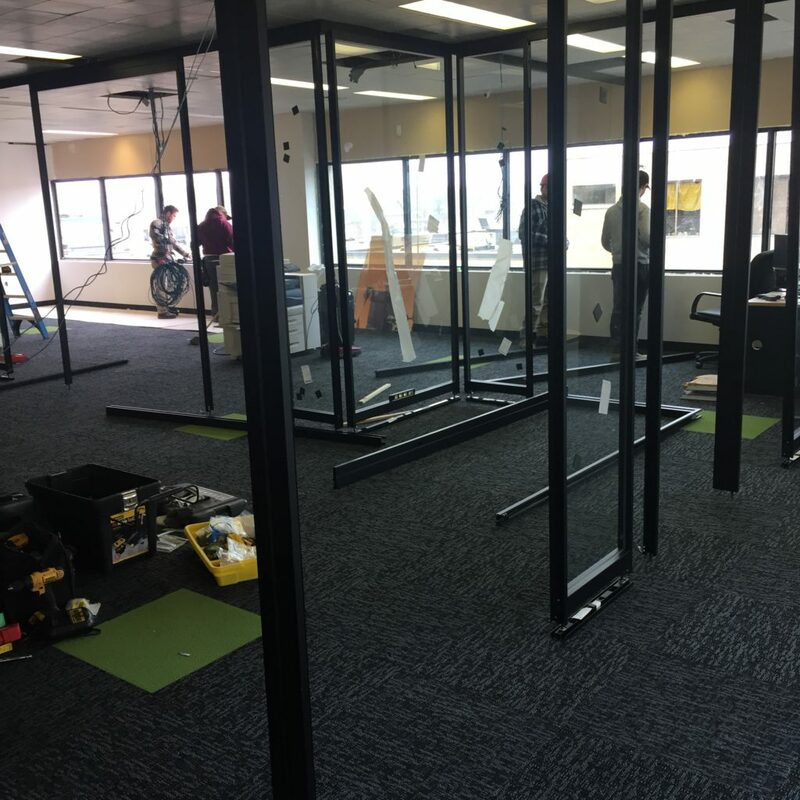 Small renovations, and big overhauls – at Brant we’re your partner in making liveable, workable office solutions that make you productive and happy. We think that’s a great combination. Give us a call and book a consultation today – our design team is here to help. 296 George St N, Peterborough, with handy, free parking off our Water Street entrance. At Brant Basics, we’re working hard to bring you the technology you need, to run your office in the most efficient, advanced way possible. To that end, we wanted to share some items from our new flyer. 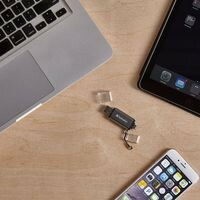 The first is the Verbatim iStore ‘n’ Go – USB flash drives for Apple Lightening Devices. These are quick, and always at hand when you need to take files to-go! 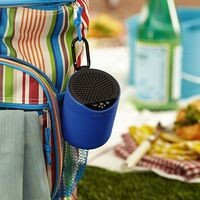 The second is a couple choices in new, Bluetooth speakers. 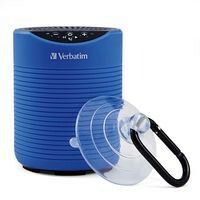 Firstly, check out the Alurtex Bump, and secondly, the Verbatim Mini! Both produce great sound, good for office music or to give a better voice in Skype calls or other purposes. 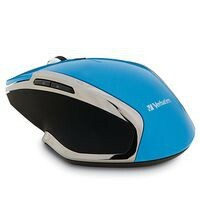 A complement product – the Vertbatim Wireless, 6-Button Deluxe Mouse is sure to put leading-edge convenience at your fingertips. All these items and more are available from our newest flyer. You can shop on-line or drop by the store. Note, free parking off our Water Street entrance. Check out the flyer here, and see specific product info on the items mentioned above, down below.